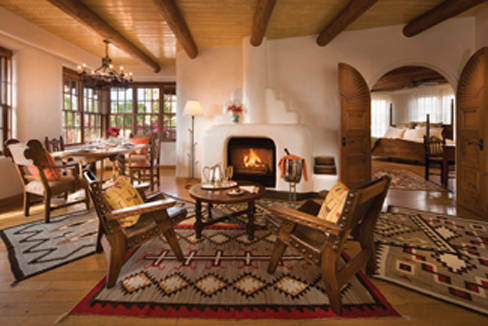 Santa Fe’s venerable La Fonda occupies the oldest hotel corner in the United States, in the oldest U.S. capital city, and dates back some 400 years. The inn on Santa Fe’s Plaza was a popular landmark at the end of the Santa Fe Trail through the Mexican-American War, Civil War, and the Topeka Santa Fe Railroad expansion. Today, its architecture remains a benchmark of Santa Fe style, and its accommodations are among the top available in the City Different. In 1881, the original adobe inn was sold to Dr. Robert Longwell and Abraham Staab. A successful merchant and landholder, Staab upgraded the property by adding retail shops on San Francisco Street and renovating the original building. However, by the time New Mexico became a state in 1912, however, the building, and Santa Fe itself, was in decline. During the citywide revitalization efforts that followed, the original fonda (inn) met its demise. In a 1919 Victory Bond rally, citizens were called on to purchase $100 bonds, which earned the buyer a chance to steer a WWI tank called a Mud Puppy into the crumbling hotel. This burst of patriotic fever raised an astounding $200,000 to build a new fonda in its place; the design blended Pueblo and Mission influences and, along with other landmarks, gave the city a unique architectural identity that is now recognized as Santa Fe style. Architect I. H. Rapp designed the 46-room inn around an interior courtyard with large vigas, a fountain, terraced roofs, balconies, and an enclosed patio facing San Francisco Street. After only two years, the new hotel closed due to financial distress. In 1926, the Santa Fe Railway purchased the hotel and leased it to the Fred Harvey Company—visionaries of the Southwest tourist industry. The company hired architect John Gaw Meem to work with designer Mary Elizabeth Jane Colter to transform the fonda into a first-rate Harvey House: a destination for rail travelers. Meem added a six-story bell tower and new wings along Water Street and the Old Santa Fe Trail, while Colter worked with local craftsmen to achieve authentic Spanish and Native American interior details, such as wooden beams and corbels, hand-painted furnishings, tin and copper light fixtures, colorful tiles and textiles, and wrought-iron railings. Area artists were commissioned to produce paintings, sculpture and murals, most of which are still on display today—including Gerald Cassidy’s dramatic canvases depicting life on the frontier, Paul Lantz’s mural depicting a Mexican Village, and Ernest Martinez’s hand-painted motifs. Over the years, the highly successful La Fonda attracted notables such as John Wayne, Ulysses S. Grant, and John F. Kennedy. In 1948, Simone de Beauvoir, the famed French existentialist and writer, visited Santa Fe during a four-month cross-country trip by Greyhound bus. Her impressions of the U.S. culminated in a book, L’Amerique au jour de jour (America Day by Day). In recent years, the outdoor courtyard has been enclosed and is now the award-winning La Plazuela restaurant, a light-filled gathering place surrounded by 460 hand-painted windows that reflect Mary Colter’s early vision. A ballroom and gym have been added, as well as 14 deluxe guestrooms and suites on the Terrace Level with spectacular views of the St. Francis Cathedral Basilica, Santa Fe Plaza, and the Sangre de Cristo Mountains. A cozy bar off the hotel lobby allows guests to observe the bustle of hotel activity, while an upstairs outdoor bar provides views of the old Plaza and street life.